WEHCO Digital Media is seeking a creative and results driven marketer to plan, design, and manage our marketing initiatives in support of growing our digital subscription business through subscriber acquisition and retention. As an industry leader, WEHCO considers this role as essential to promoting our brand and mission of delivering quality local journalism in the communities we serve. As the company's Marketing Manager, you will work alongside all levels of management at newspaper divisions throughout the company. The Marketing Manager will work on print and digital design projects to support WEHCO's newspaper markets branding and subscription marketing initiatives. This is a deadline-oriented position that requires strong multi-tasking, interpersonal, and communication skills. Plan, create, design, & oversee the production of all marketing materials that support subscription sales & branding campaigns across multiple channels including but not limited to email, online display advertising, audience extension, print advertising, & social media advertising. Maintain visual/branding continuity for all aspects of marketing campaigns across assorted media & initiatives..
Work with cross departmental teams across multiple markets to develop, prepare & execute monthly & quarterly marketing plans. Maintain quarterly marketing calendar for WEHCO's newspapers & track marketing campaign results. Ensure marketing deliverables & scheduling objectives are met. Maintain promotional subscription offer checkout pages ensuring all offers align with established pricing guidelines & branding objectives. Guide & help in preparation of marketing activity reports & present them to the leadership team. Bachelor's Degree in Marketing or a related field is preferred. 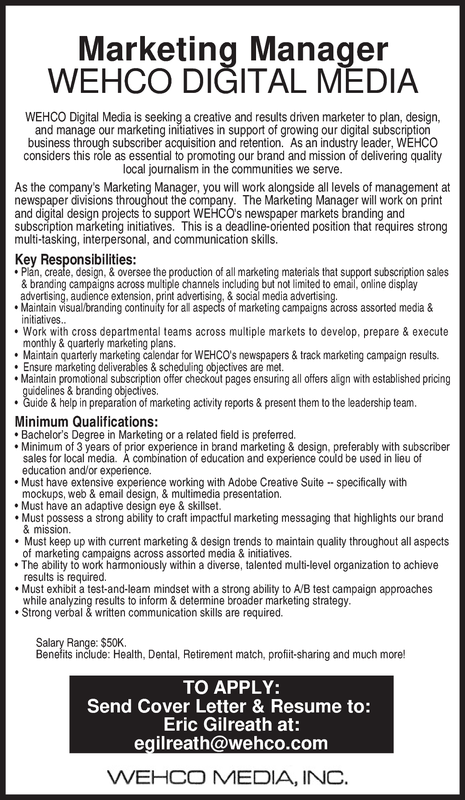 Minimum of 3 years of prior experience in brand marketing & design, preferably with subscriber sales for local media. A combination of education and experience could be used in lieu of education and/or experience. Must have extensive experience working with Adobe Creative Suite -- specifically with mockups, web & email design, & multimedia presentation. Must have an adaptive design eye & skillset. Must possess a strong ability to craft impactful marketing messaging that highlights our brand & mission. Must keep up with current marketing & design trends to maintain quality throughout all aspects of marketing campaigns across assorted media & initiatives. The ability to work harmoniously within a diverse, talented multi-level organization to achieve results is required. Must exhibit a test-and-learn mindset with a strong ability to A/B test campaign approaches while analyzing results to inform & determine broader marketing strategy. Strong verbal & written communication skills are required. Benefits include: Health, Dental, Retirement match, profiit-sharing and much more!